Sedona Interfaith Fellowship | A spiritual oasis -- all are welcome. A spiritual oasis -- all are welcome! To be an opening through which individuals may more deeply experience the presence of God. To create this opening by drawing upon the wisdom and beauty of the world’s great spiritual traditions. Our Mission Statement is what sets the tone for the Sunday Gatherings and other activities. We explore various topics of spiritual interest from the perspective of the world’s great religions and spiritual paths, as we open ourselves to the beauty and depth of our own personal experiences of God, by whatever name our Source is called. AT THIS TIME, WE ARE DISCONTINUING SUNDAY GATHERINGS. Check in periodically for an update of the schedule. See the Events and Announcements page for details. Get your updates automatically by signing up on the blog. NO SUNDAY GATHERINGS AT THIS TIME. In the meantime, keep practicing love, keep shining your light! Sedona Interfaith Fellowship is dedicated to finding and using the beauty and wisdom from all of the world’s sacred paths, and to be an opening through which individuals may more deeply experience the presence of God. Reverend Susan Perry felt called to ministry at the age of ten, and twenty-five years later was ordained by the New Seminary in New York, in 1994, with a license as Minister, Spiritual Counseling. With its focus on the interfaith model, the seminary inspires individuals to expand their spiritual horizons to respect and honor the traditions of all of the world’s faiths. Susan’s ministry began in her own living room in 1991, then expanded to the more public setting of the Sedona Public Library’s Community Room in 1996. • Living in a spiritual community for twenty years. As a Sanctuary, the Fellowship is a place where the seeker can find rest and solace from the daily walk of life. It is a place for nurturing and healing the soul on its journey of awakening. As a Place of Fellowship, Sedona Interfaith is open to people from all walks of life, no matter what spiritual path one is or isn’t on. It is a place where the seeker may come to experience the oneness of all God’s children. As a Center of Worship, the Fellowship utilizes the wisdom found in all of the world’s great spiritual traditions, to enlighten and illuminate the spiritual journey. It is a safe environment in which individuals may deepen their own relationship with and experience of God. As a Learning Center, Sedona Interfaith Fellowship seeks to help break down the barriers people have built against different faiths, cultures, and ways of thinking. 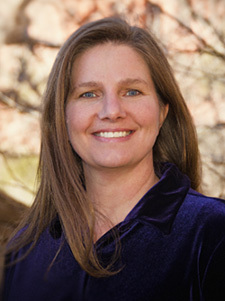 Educational opportunities range from hands-on experiential studies of spiritual practices and techniques, including those that relate to personal and inner growth, to scholarly studies of sacred texts and other writings. As a Focal Point for Action and Service, the Fellowship challenges and encourages its participants to recognize that all God’s children are deserving of love. This love can be expressed in a variety of ways, for example, through service projects, prayer groups, educational forums, or action committees. In sum, Sedona Interfaith Fellowship is a Spiritual Oasis, where the seeker may come to rest and replenish, to drink a new drink to refresh their soul, inspire their spirit, and bring new life and meaning into their daily lives. That God is all there is. That although God is all there is, we experience ourselves as separate humans on earth. That God has sent enlightened teachers through the ages to bring a message of hope and deliverance to humankind. That this message of hope, although different in expression from tradition to tradition, is at its core one and the same: God loves us, and wants us to come home. That among the many holy messengers throughout history, all of whom have a voice within the Fellowship, Jesus holds the unique position as model and teacher of the interfaith principles and ideals for this Fellowship. His inspiring message is woven throughout this ministry, bringing hope and peace through the example of his love. Rev. Susan Perry is available to officiate at your wedding! This is a special day, and it would be an honor and a privilege to share in it with you. I’ll work with wedding couples to create a meaningful and memorable ceremony to commemorate this joining. 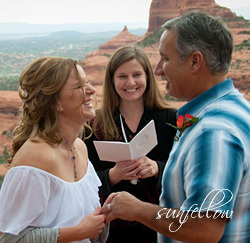 As the founding minister of Sedona Interfaith Fellowship, I recognize the importance of honoring whatever spiritual or religious backgrounds my couples come from. My focus is on the love and connection between the two of you, and this guides the planning of the ceremony to make it a perfect reflection of your values and vision. 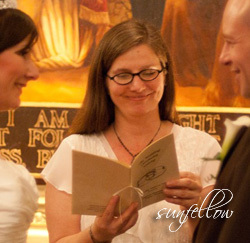 With more than twenty years of officiating experience, I will help to create an environment at your ceremony full of presence, intimacy, joy, and love. We’ll find the right balance in the moment between those precious expressions of caring and when a little humor is called for! Additional fees may be applied to: Rehearsal, extended travel, guest count larger than 50, attendance and blessing/prayer at reception, for example.